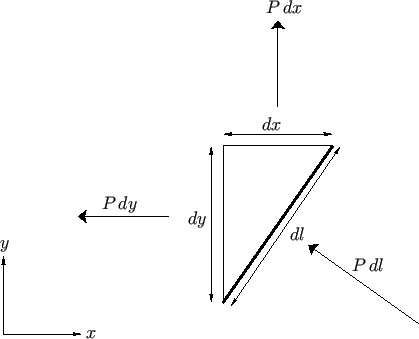 Let us evaluate the resultant force (per unit length), and the resultant moment (per unit length), acting on the fluid within the curve as a consequence of this pressure distribution. 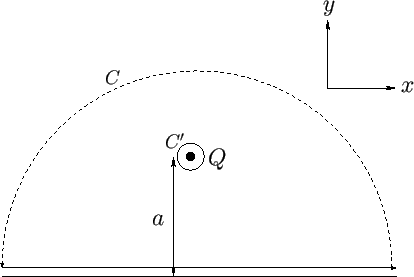 Figure 6.19: Force acting across a short section of a curve. This result is known as the Blasius theorem, after Paul Blasius (1883-1970). In fact, Equations (6.186) and (6.188) hold even when is not constant on the curve , as long as can be continuously deformed into a constant- curve without leaving the fluid or crossing over a singularity of . Figure 6.20: Source in the presence of a rigid boundary. In other words, the boundary exerts a force (per unit length) on the fluid. Hence, the fluid exerts an equal and opposite force on the boundary. Of course, this result is consistent with Equation (6.47). Incidentally, it is easily demonstrated from Equation (6.188) that there is zero moment (about the -axis) exerted on the boundary by the fluid, and vice versa. This force acts in the opposite direction to the flow. Thus, an external force , acting in the same direction as the flow, must be applied to the source in order for it to remain stationary. In fact, the previous result is valid even in a non-uniformly flowing fluid, as long as is interpreted as the fluid velocity at the location of the source (excluding the velocity field of the source itself). This force is directed at right-angles to the direction of the flow (in the sense obtained by rotating through in the opposite direction to the filament's direction of rotation). Again, the previous result is valid even in a non-uniformly flowing fluid, as long as is interpreted as the fluid velocity at the location of the filament (excluding the velocity field of the filament itself).